How to detect inconsistencies in magnetic beads separation? It is hardly breaking news that separation technology is one of the most complex and important areas of biotechnology. Finding cost-effective separation techniques is a crucial factor for the growth of industrial biotechnology. Not only is it necessary at the application point (diagnostics, protein purification, cell sorting) but also to facilitate large-scale production. Biomagnetic separation techniques are becoming increasingly important with a wide range of possible applications in the biosciences. Magnetic micro- or nanospheres can be separated easily and quickly by magnetic forces and can be used in conjunction with bioaffinity ligands, e.g. antibodies or proteins with a high affinity to the target. Although scientists typically use these beads in relatively small quantities, once the kit hits the market and has proven itself useful, the production volume for the kit must necessarily increase to meet demand. There will be a need to supply kits to many hospitals and labs globally. A cost effective method of producing magnetic beads is therefore required. As we will discuss in the following articles, the main problem with Biomagnetic Separation is how to characterize and monitor the process. The principle behind the process is simple: the effect of a magnetic force on particles in a solution. However, although it does not look like a complex process, many users mistakenly think it is no more than a mere block magnet exerting some degree of force over a nearby test tube. The problem with this over-simplistic approach is the undefined process conditions: a block magnet does not establish the value of ‘magnetic force’. As consequence, it is impossible to determine the key parameters of the biomagnetic separation process, how to validate them or what will happen when we transfer the process to a different volume or setup. In most cases, the ‘END’ of the process is determined simply by the technician visual observation, and sometimes ‘standardized’ by the observed time separation. Even when carefully executed, this approach only gives information about the situation after the process is finished, without monitoring what is happening during it. The lack of validation/control tools causes serious problems when the separated product shows non-compliances or when experiment results are inconsistent. No objective data can be discussed and, because the exact separation conditions are not well defined, checking the potential problem causes is difficult, if not impossible. 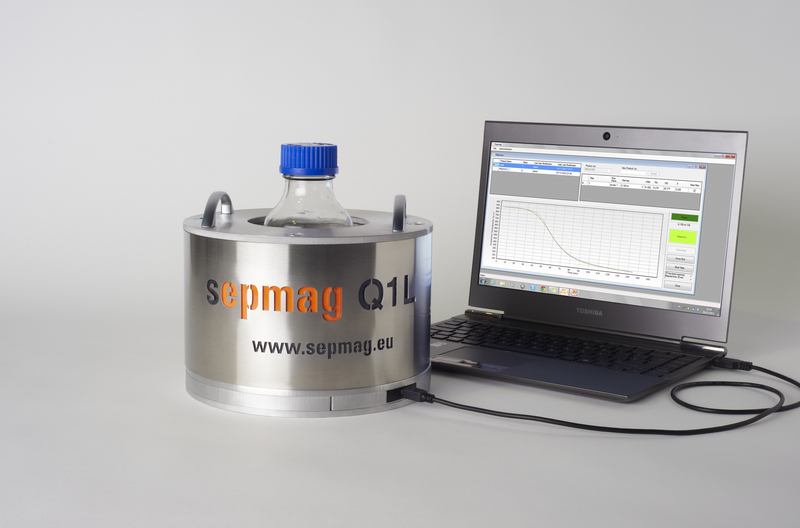 In the following articles, we will explain how to approach the problem of monitoring Biomagnetic Separation processes. Firstly, homogeneous biomagnetic separation conditions must be established in order to optically monitor changes in the suspension. This methodology can be applied to both R&D, where technicians usually need to compare different samples in small volumes, and production, where the purpose is to ensure that successive batches are identical.